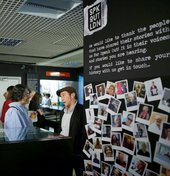 Speak Out London - Diversity City is a community led LGBTQ Oral History project based at London Metropolitan Archives. The project has focused on histories from 1945 to the present, creating a significant contemporary archive. Visit our recording booth to add your voice and story to this powerful community collection.